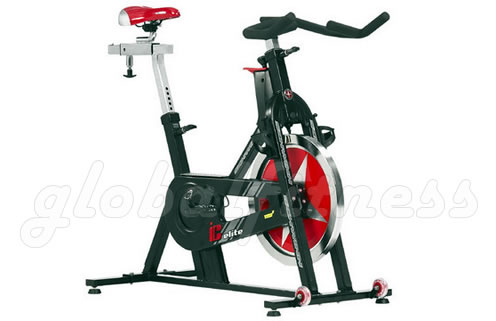 Stand out while you stand up and spin on the Schwinn® IC Elite™ Group Cycling Bike. Built to endure countless hours of rigorous group exercise, the IC Elite™ catches your eye right away with its stylish, jet-black frame, and bright red flywheel. Style is backed up with substance here, too, as the IC Elite™ sports many custom racing bike features such as a Shimano sealed-cartridge bottom bracket and cold forged crank arms. You'll feel like you're on the road, but protected from the elements, with corrosion-preventing stainless pins, large diameter leveling feet for stability, and reinforced axels for increased service life. In addition, you get the revolutionary Smart Release™ System by Schwinn®, which offers all the benefits of a fixed gear machine along with a unique coasting feature. Pedal with confidence using a resistance system that offers you an infinite range of settings and a self-lubricating chain drive that will keep you from slowing down for mechanical reasons. The fully adjustable seat also makes the IC Elite™ stand out, with fore and aft, up and down positioning, along with stainless steel locking pop-pins. The IC Elite™ also comes with a high inertia drive system comprised of a 38 lb flywheel and direct-drive gearing. Handlebars are easy to access and coordinate to your desired comfort setting.